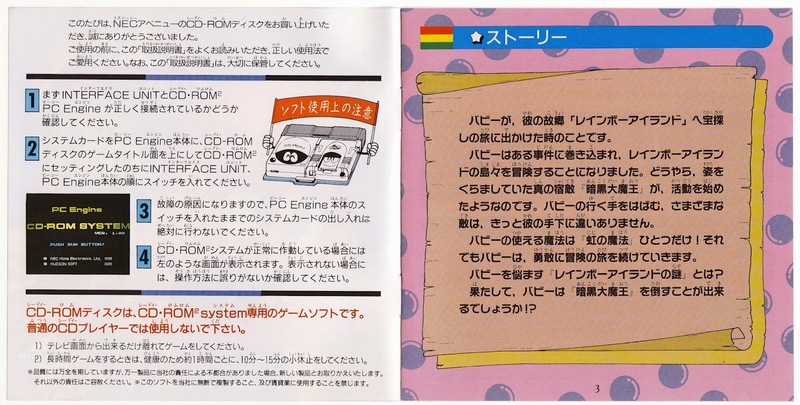 I have some good news and some bad news to share with you in terms of this PC Engine port's instruction manual. 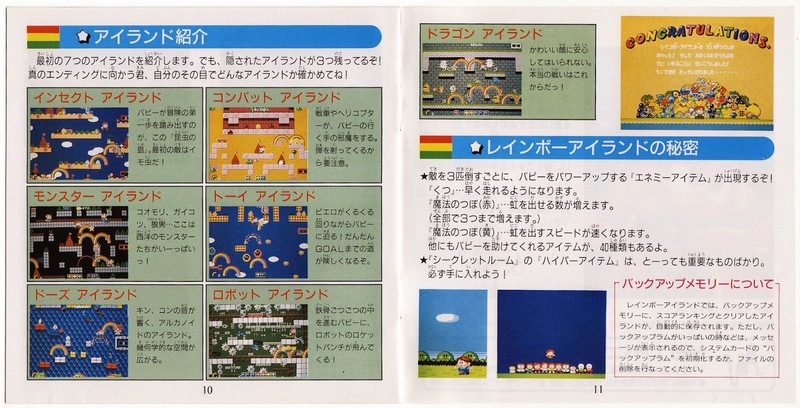 Let's start with the good news: Rainbow Islands' manual is in full color--unlike many of the ones produced for this system. 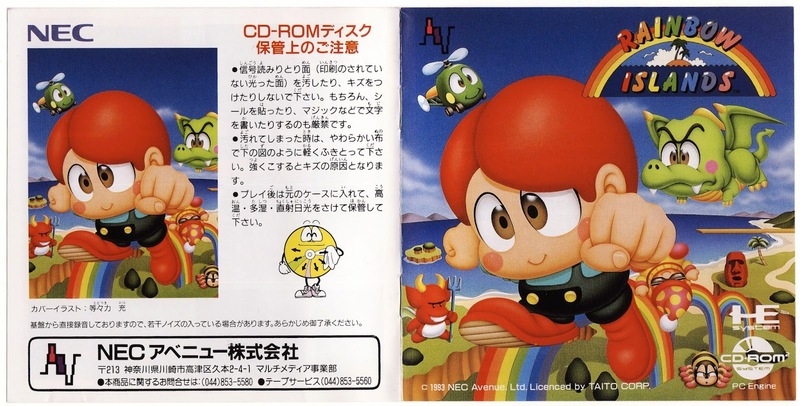 The bad news: the illustration that appears on its front and back covers is the only one to be found in all of its 14 or so pages. 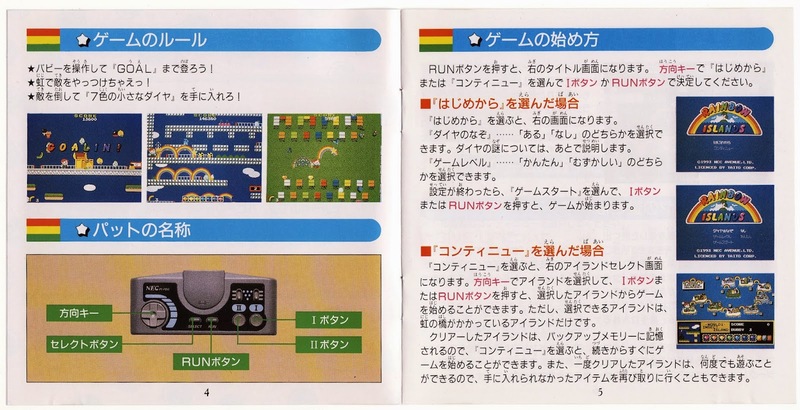 Under NEC Avenue's care, though, Rainbow Islands' manual is crammed full of color screenshots rather than illustrations of any ilk. 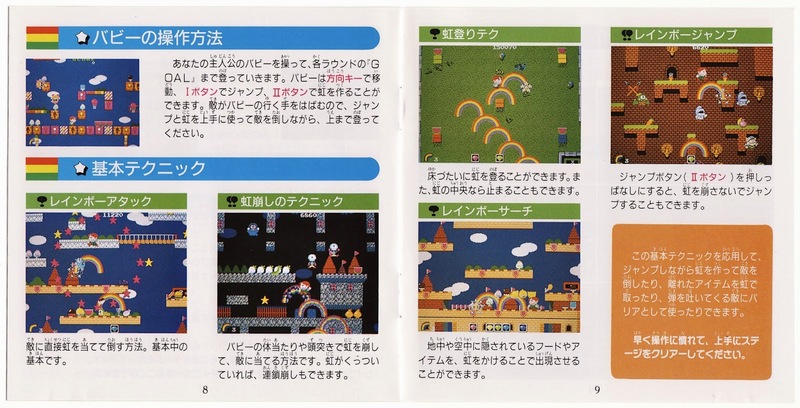 They're nice enough screenshots, it has to be said, but who on earth would rather encounter screenshots than illustrations while flipping through a game manual? Not me, I'll tell you that much. 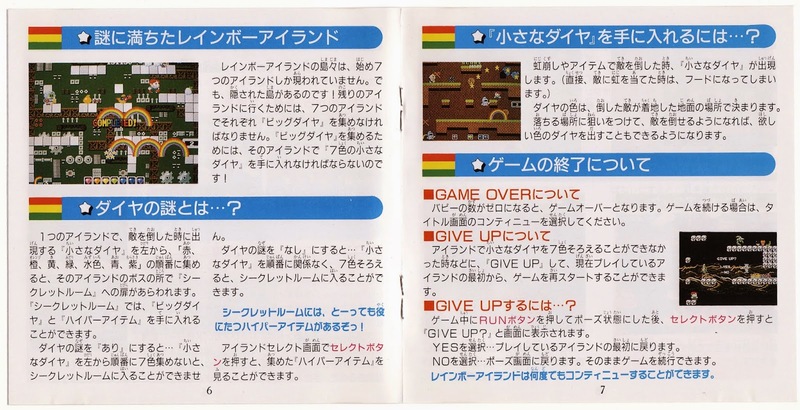 At least the designers responsible for this instruction manual provided readers with looks at a good number of the game's stages--and even what I'm guessing is one of its endings, based on the colorfully congratulatory screenshot seen in upper-right corner of the page below. That said, I would've exchanged all of this manual's color for a few doodles or drawings or other pieces of art. Oh, well, you can't always have everything, can you? Hopefully Atlantean is successful enough to spark some more homebrew games! It's awesome to see a new PCE release. I'm in agreement with you on Deep Blue--it was a chore to play but we need more underwater shooters. I'm ready for a new Sqoon game personally. Well, it seems Aetherbyte has made quite a few homebrew PCE/TG16 games so far, Jeremy, so I'm guessing they'll continue making them even if this one isn't a smash success--although of course I hope it *is* a success, assuming the product is worth it, of course. And, YES, a new Sqoon game would be amazing!